Biblical References: Solomon's House and Temple—Palace of Ahashuerus. 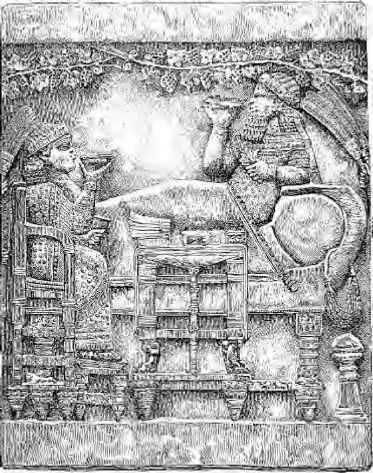 Assyrian Furniture: Nimrod's Palace—Mr. George Smith quoted. 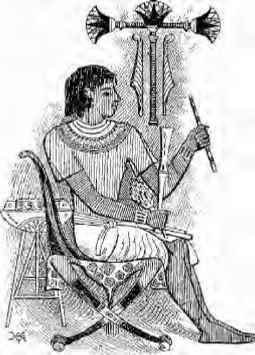 Egyptian Furniture: Specimens in the British Museum—the Workman's Stool—various articles of Domestic Furniture—Dr. Birch quoted. Greek Furniture: The Bas Reliefs in the British Museum—the Chest of Cypselus—Laws and Customs of the Greeks—House of Alcibiades—Plutarch quoted. Roman Furniture: Position of Rome—the Roman House—Cicero's Table—Thyine Wood—Customs of wealthy Romans—Downfall of the Empire. We know, too, from the bas reliefs and papyri in the British Museum, how advanced were the Ancient Egyptians in the arts of civilization, and that the manufacture of comfortable and even luxurious furniture was not neglected. In them, the Hebrews must have had excellent workmen for teachers and he first reference to woodwork is to be found in the Book of Genesis, in the instructions given to Noah to make an Ark of1 gopher wood, "to make a window," to "pitch it within and without with pitch," and to observe definite measurements. From the specific directions thus handed down to us, we may gather that mankind had acquired at a very early period of the world's history a knowledge of the different kinds of wood, and of the use of tools. resulted from some generations of carpenters, joiners, weavers, dyers, goldsmiths, and other craftsmen. There are, unfortunately, no trustworthy descriptions of ancient Hebrew furniture. The illustrations in Kitto's Bible. Mr. Henry Soltan's "The Tabernacle, the Priesthood, and the Offerings," and other similar books, are apparently drawn from imagination, founded on descriptions in the Old Testament. In these, the "table for shew-bread" is generally represented as having legs partly turned, with the upper portions square, to which rings were attached for the poles by which it was carried. As a nomadic people, their furniture would be but primitive, and we may take it that as the Jews and Assyrians came from the same stock, and spoke the same language, such ornamental furniture as there was would, with the exception of the representations of figures of men or animals, be of a similar character. The discoveries which have been made in the oldest seat of monarchical government in the world, by such enterprising travellers as Sir Austin Layard, Mr. George Smith, and others, who have thrown so much light upon domestic life in Nineveh, are full of interest in connection with this branch of the subject. 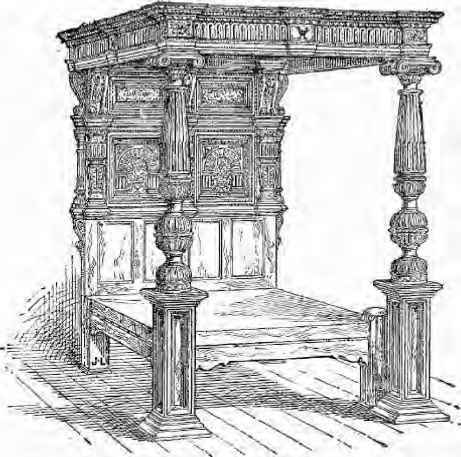 We learn from these authorities that the furniture was ornamented with the heads of lions, bulls, and rams; tables, thrones, and couches were made of metal and wood, and probably inlaid with ivory; the earliest chair, according to Sir Austin Layard, having been made without a back, and the legs terminating in lion's feet or bull's hoofs. Some were of gold, others of silver and bronze. On the monuments of Khorsabad, representations have been discovered of chairs supported by animals, and by human figures, probably those of prisoners. 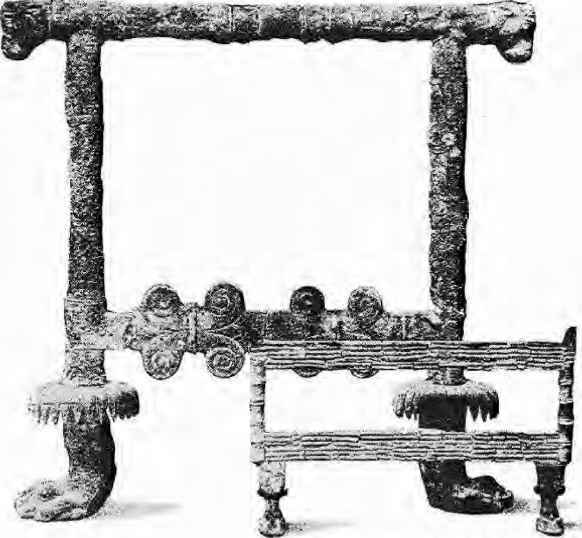 In the British Museum is a bronze throne found by Sir A. Layard amidst the rains of Nirnrod's palace, which shews ability of high order for skilled metal work. Mr. Smith, the famous Assyrian excavator and translator of cuneiform inscriptions, has told us in his "Assyrian Antiquities" of his finding close to the site of Nineveh portions of a crystal throne somewhat similar in design to the bronze one mentioned above, and in another part of this interesting book we have a description of an interior that is useful in assisting us to form an idea of the condition of houses of a date which can be correctly assigned to B.C. 860:— "Altogether in this place I opened six chambers, all of the same character, the entrances ornamented by clusters of square pilasters, and recesses in the rooms in the same style; the walls were coloured in horizontal bands of red, green, and yellow, and where the lower parts of the chambers were panelled with small stone slabs, the plaster and colours were continued over these." Then follows a description of the drainage arrangements, and finally we have Mr. Smith's conclusion that this was a private dwelling for the wives and families of kings, together with the interesting fact that on the under side of the bricks he found the legend of Shalmeneser II. (B.C. 860), who probably built this palace. An ornament often introduced into the designs of thrones and chairs is a conventional treatment of the tree sacred to Asshur, the Assyrian Jupiter; the pine cone, another sacred emblem, is also found, sometimes as in the illustration of the Khorsabad chair on page 4, forming an ornamental foot, and at others being part of the merely decorative design. 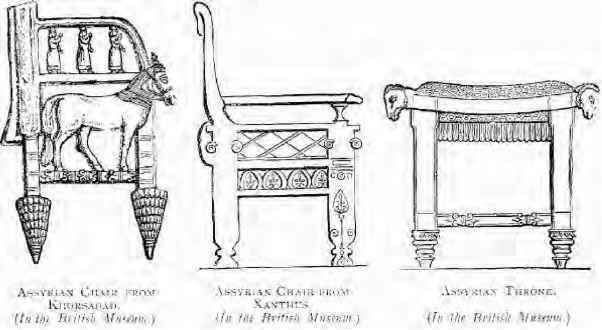 The bronze throne, illustrated on page 3, appears to have been of sufficient height to require a footstool, and in "Nineveh and its Remains" these footstools are specially alluded to. "The feet were ornamented like those of the chair with the feet of lions or the hoofs of bulls." 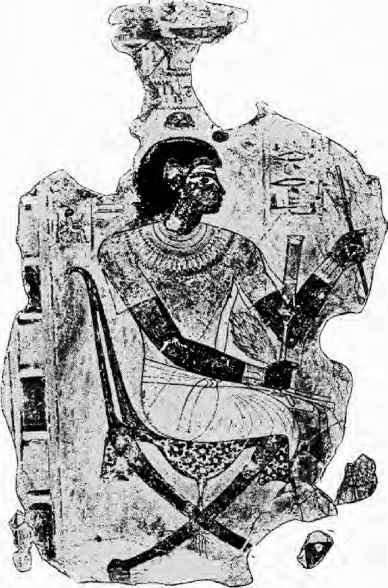 The furniture represented in the following illustration, from a bas relief in the British Museum, is said to be of a period some two hundred years later than the bronze throne and footstool. In the consideration of ancient Egyptian furniture we find valuable assistance in the examples carefully preserved to us, and accessible to everyone, in the British Museum, and one or two of these deserve passing notice. Nothing can be more suitable for its purpose then the "Workman's Stool:" the seat is precisely like that of a modern kitchen chair (all wood), slightly concaved to promote the sitter's comfort, and supported by three legs curving outwards. This is simple, convenient, and admirably adapted for long service. 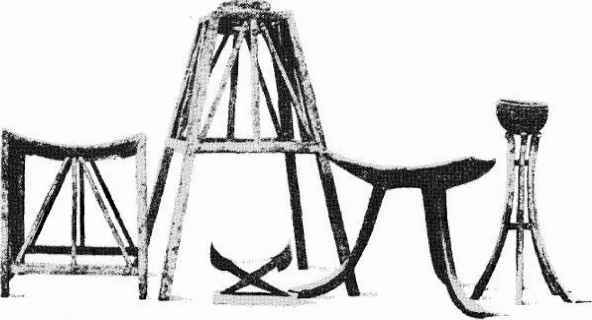 For a specimen of more ornamental work, the folding stool in the same glass case should be examined; the supports are crossed in a similar way to those of a modern campstool, and the lower parts of the legs carved as heads of geese, with inlayings of ivory to assist the design and give richness to its execution.